Applications, using ORMs to access data usually don't interact with database directly. Instead they interact with ORM run-time - query entities via LINQ, work with them, and then post modified entities via SaveChanges (or SubmitChanges). ORM runtime, in its turn, interacts with the database - opens connections, queries and updates data via SQL, etc. Most profilers show just the interaction with the database - SQL statements execution, database connecting, etc. LINQ Insight offers true ORM profiler - it allows you to really profile the interaction between applications and ORM! With our LINQ Profiler tool you can see how much time LINQ statement or SubmitChanges call takes to execute as a whole even if it generated multiple SQL statements. 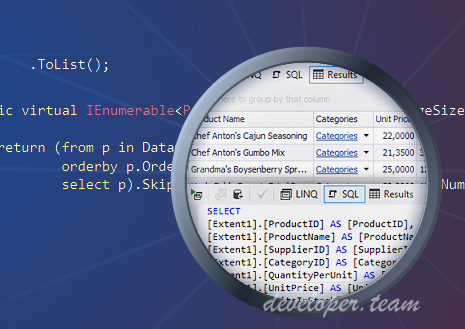 You profile exactly the code you write and study the real performance of your LINQ code. Moreover, there is no need to modify your project at all! Just open the LINQ Profiler window and click the Start profiler session button on its toolbar. Then run your project and get real-time data on ORM events in the LINQ Profiler window. Profile ORM Data Access with LINQ Insight!